82304 leads the 1J82 12:17 Marylebone to Wrexham service past Old Milverton on 20 February 2009. 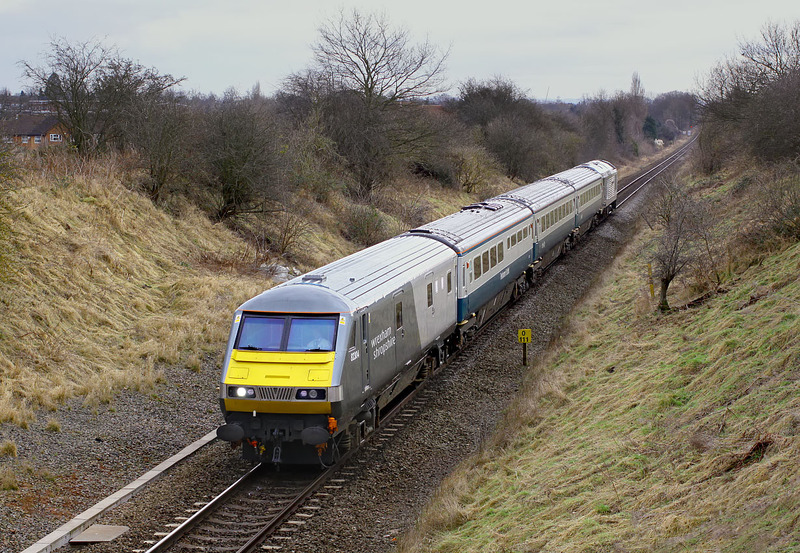 Note that the Wrexham & Shropshire Railway livery does not yet extend to the coaches. 67012 was doing the pushing at the rear. This picture would have been unfit for inclusion on this website without the use of layers in Photoshop. Because the sun had gone in but the sky in the background was still bright the initial image showed a virtually blank sky and a burnt out roof area to the train, and yet paradoxically virtually no shadow detail. Creating layers for each f these problem areas and adjusting accordingly along with careful feathering and blending has yielded a natural result. After all, you wouldn't know there had been any work done, would you?